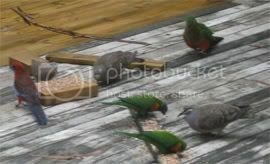 Having been off sick three days this week I fed the birds that arrived on our deck in the afternoon (I usually do this only early in the morning). I know some people think this is a bad idea, but I try to regulate it fairly carefully so they're not overly dependant, and try to only feed native birds, and with a variety of seed. There's at least one case - a cockatoo with a ring on his leg who initially arrived partially clipped - who wouldn't have survived without our help. He's still coming, often with lots of friends. On Monday, a parrot I had never seen before appeared! J knew straight away that it was a "28 parrot," which was a name unfamiliar to me, even though my bird knowledge is very thorough. 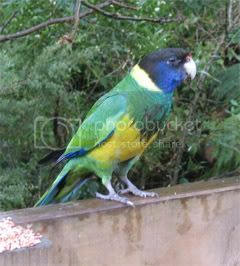 She was right, this guy is also called an "Australian ringneck" and is evidently an aviary escape. 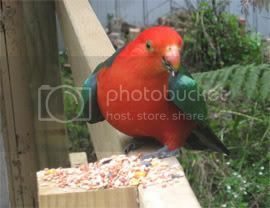 He was getting on well with the King parrots and showed up again this morning. The other main seed-eating birds are red-browed finches, some bronzewings, the occasional grey currawong, blackbird, magpie or even raven, and a flock of turtle-doves, if I don't chase them off (which I always do, as they scare more easily than other birds). What I am sick of is neighbours' cats! We never used to have any around our area, which backs onto forest, but lately a couple of toms (evidently owned) have taken to hanging around our place in search of birds, possums and other wildlife. It's infuriating, as we're trying to maintain a place that's wildlife friendly! This year's entry in the Stanley Awards, another chance to prove my complete immunity from being nominated for awards of any sort :). These are selected panels from some of my professionally published work over the past year. Typical of the sort of thing I sketch when I'm playing with ideas, these kinds of pieces aren't really meant to be read by anyone. The drawing part of this took about half an hour last night, and I decided to post it here, though I'm not promising I'll leave something so unfinished (and kind of abstract) up.